Don’t miss the 18th Annual Moorpark Blue and Gray Civil War Reenactment on March 17-18, 2018 at the Hitch Ranch in Moorpark, California, the largest battle reenactment on the West Coast. 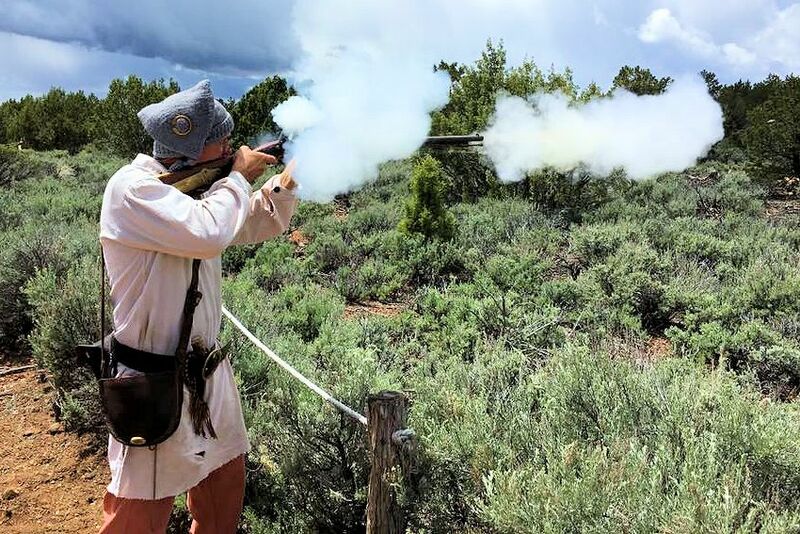 Hundreds of Reenactors and thousands of spectators come from all over the state and nation each year for this spectacular event. Moorpark Blue and Gray Civil War Reenactment activities include four battle reenactments (with cannon and musket fire), Abraham Lincoln delivering the Gettysburg Address, solider and civilian encampments, Confederate army surrendering to the Union army and period dancing and music. The featured battles vary each year, but are always torn from the pages of history. Much time is spent in planning its reenactment for the time and space available. The Moorpark Blue and Gray Civil War Reenactment is presented by the Rotary Club of Moorpark, and is designed to educate the public about the historical significance of the Civil War and its effect on the United States including the abolishment of slavery. There will also be historic dancing and music playing near the food court. Union and Confederate encampments can be visited where various demonstrations occur, such as blacksmithing, doctor’s tent, the chapel, the use of arms and cooking on an open fire, etc. The soldiers are in authentic costumes and stay in character as they converse with the public, transporting them back to the 1860s. The Civilian Camp is right alongside the soldier’s camps. Demonstrations here include many skills needed for day-to-day life in that period, such as sewing, weaving, cooking, etc. Sutlers are civilian merchants who sell provisions to an army in the field, in camp, or in quarters. Sutlers sold wares from the back of a wagon or a temporary tent, traveling with an army or to remote military outposts. At the Moorpark Blue and Gray Civil War Reenactment, they will be selling reenacting supplies and uniforms, shoes, leather goods, weapons, (non-firing, non-functional), and other related items. Hours: Saturday & Sunday: 10:00 a.m. – 5:00 p.m.
Save money and purchase your tickets online. $20/adults (online, $22 at the gate, Early Bird $14] $15/students: ages 6 through 17 (online, $17 at the gate, Early Bird $11] Family Package (online only): Includes 4 Admission Tickets and 4 Bleacher Seats for 2 Battles. Only $85.00…Savings up to $40. [Early Bird $70] Free/ages 5 and under. Bleacher Seats: additional $4 per person, per battle. Free Shuttle: Shuttle will take visitors to the event site. Please Note: Bleacher seats are optional, but preferable for the best viewing experience. Parking is $5 (VIP excluded) with Free shuttles provided. If you have any questions regarding the weather, please note that this website will reflect this information. Our phone is 805.279.5253 or email info@moorparkrotary.com. Handicapped parking is available, please be aware this is an open field and the ground is not smooth. Bring American History to Life! To get students to fully appreciate what it was like during the American Civil War, there is no better way to share those impressions than to take them to a quality Civil War Reenactment, or encourage them to attend and gather information that they can submit for extra class credit. Over the past several years, we have had a number of educators call and arrange for a group discount in order to take their American History class to our event on Saturday or Sunday. When you see the smiles on their faces and the enthusiasm of the students while they’re learning about events during the War, you realize what a wonderful educational experience it is for them. They get to see first-hand what a typical Civil War encampment looks like, the surgeon’s tent, the soldier’s clothing, their guns and ammunition, canons firing, the thrill of talking to Abraham Lincoln and General Lee, a typical soldier’s mess, and they’ll be able to talk to re-enactors, in full costume and in character. All of this will bring the experience to life for the students. If you haven’t planned a field trip for your history class, we encourage you to consider our event. There is no better history lesson for your students than to expose them to the look and feel of our American Civil War and the extreme sacrifices that so many made in our Country for the freedoms that we enjoy today as a free Nation. Our event committee has approved a special Group Rate. See Group Reservations (20 or more) in the Contact section of this website. Go to “Group Reservations” for more information on ordering your tickets today. There is ample food service, reasonably priced at our event in our food court along with tables and chairs for keeping your group together. On our website, you will find several photos that will show you what our event looks like and what your students can expect to see in the encampment. Your students can see both North and South encampments. We expect to have over 700 re-enactors and their families in costume along with a large contingent of Civil War Sutlers, that were the merchants of that era that followed the encampments. We have also posted a Civil War Questionnaire that your students can complete by gathering information at the event. They have to do interviews, in many cases, to gather the information, so it’s a live learning experience. Finally, you will find links above to two short VIDEO clips, that we produced, called Gettysburg. Please click on the links and take a look. They are quality pieces of Abraham Lincoln reciting the Gettysburg address interspersed with battle scenes of past year’s events. It’s quite moving and I would encourage you to play it for your American History class. The other video is quite good too. This event is all about teaching our younger generation of the sacrifices that were made by so many during our American Civil War. And there is no better way to communicate that than by scheduling a field trip to our event and letting us host you and your class to a wonderful learning experience. Please go to Contacts / Group Reservations for more information. Mark your calendar today so you don’t miss the next Blue and The Gray Civil War Reenactment on March 17-18, 2018 at the Hitch Ranch in Moorpark, California.